The third annual edition of Earthwave will be staged at Muizenberg and on other beaches worldwide on Sunday, October 4, 2009. Earthwave is a global environmental initiative that promotes sustainable lifestyle choices by harnessing the huge interest surrounding local surfing communities attempting to set a new Guinness World Record (GWR) for the highest number of surfers riding the same wave simultaneously. Started at Muizenberg beach in 2006 by the father and son duo of Paul and Dene Botha of Kahuna Promotions, the inaugural GWR attempt attracted 349 participants, more than 1500 spectators and received unprecedented print, radio, TV and internet coverage both locally and internationally. While participants from every walk of life enjoyed a day of fun in the surf, raising the record from 44 to 73 surfers on one wave, others attended a debate on sharks and entered fund-raising activities where tens off thousands of Rands in sponsored goods were given away. Acknowledging the immense interest in the GWR attempt, Earthwave went global in 2007. 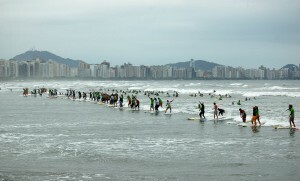 Inspired by Nobel Laureate Al Gore’s film “An Inconvenient Truth’, the emphasis of the event was changed from sharks to raising awareness of climate change and Kahuna Promotions challenged surfing organisations worldwide to join the movement, stage an attempt on the GWR and address climate change on the same day. Since then half a dozen early adapters have run Earthwave events with Australia, Reunion Island, England, Brazil, Argentina and Tahiti joining South Africa in combining a fun in the surf day with exhibits and talks by environmental organisations, Art Challenges and plenty of give-aways and fund-raising activities. Earthwave Brazil raised the GWR to 84 surfers on one wave in 2007 and then to an incredible 100 surfers in 2008, both of which received global news and TV coverage. In 2009 people worldwide are aware of the climate crisis through the efforts of organisations such as Earth Day, Earthdance, Earth Hour, Live Earth, WWF and others. The emphasis of Earthwave is thus evolving and this year the events will promote the sustainable lifestyle choices that are now available as we seek to reduce our impact on the environment. These choices include renewable energy; recycling; reducing waste and energy use; re-usable rather than disposable items and bio-degradable, organic and local products and packaging, all of which not only help the environment but save money at the same time. Endorsed by such prestigious organisations as the International Surfing Association (ISA), the Surfrider Foundation, whose Argentinean chapter has signed up again for 2009, and Surfing South Africa, the national controlling body for the sport in this country, Earthwave is set to continue growing from strength to strength in the years ahead. 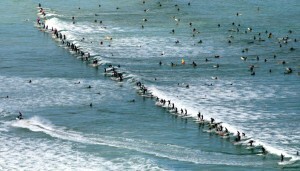 In 2009, Earthwave will be celebrated in Cape Town, South Africa; Santos, Brazil; Mar del Plata, Argentina and in Tahiti.